So, why is everyone using the Delco 10-SI and 12-SI alternators for most 12 volt conversions on all brands of vehicles? Simple, they are cheap, durable, and readily available. No other alternator comes close. 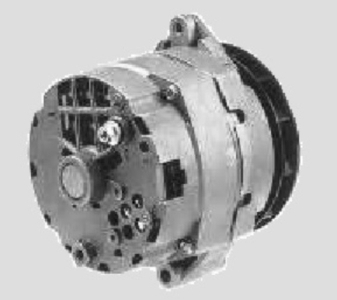 The Delco® 10-SI alternator is by far the most common choice for 12 volt tractor conversions primarily because new or rebuilt versions cost much less than any other alternator. The Delco is the ONLY alternator I have rebuilt and know much about. I could probably figure out how to get other alternator brands to work on a Ford tractor if I had to, but I don't WANT to. Even if a different brand of alternator is free and in perfect condition, it will eventually fail and need to be replaced. That is not a good time to find out we need to spend $180 and wait two days for a replacement, or rewire the tractor AGAIN, so we can use the cheap, durable, and readily available Delco® 10-SI alternator. Some people may balk at putting a GM® alternator on a Ford® Tractor. After digging through several catalogs, what I found was that the best choice of various Motorcraft alternators was on the '80s Ford Mustang® and some other models. Guess what, from four feet away, the vintage Motorcraft® alternator might as well be a twin to the Delco®, but it costs nearly $200 bucks! If it bothered me that much, I'd remove the Delco logo with a grinder and stick a Ford Script decal on it. There, now it's an aftermarket vintage Ford Tractor part, GRIN. Seriously, if anyone is that worried about originality, why are we even discussing doing a 12 volt conversion? Ok, now that I've thoroughly annoyed all Ford lovers, there is another inexpensive solution. The Delco alternators have been completely cloned by several aftermarket parts suppliers. Most of the replacement parts available to rebuild these alternators are not Delco parts. Many of the rebuilt alternators I've bought were in un-branded cases. Another option is to buy one of the chrome alternator cases and swap the guts from any used Delco 10-SI into the chrome case. There are two basic versions of the Delco 10-SI, the 1-wire version and the 3-wire version. The 1-wire version is much easier to hook up, and is the preferred version to use for most tractor conversions. Earlier 1-wire versions were less than ideal for a low RPM tractor engine. The newer versions have fixed the low RPM problem, so I am using a 1-wire Delco alternator on my 46. It's been a few years now and there have not been any problems with that system. I only had one re-curring problem with that tractor. The front axle would occasionally pivot far enough to drive the steering linkage into the alternator. This often knocks the adjustment loose, so the alternator stops charging and the water pump stops pumping. The alternator shoudl be mounted as high and as tight to the engine as it can get. The simle solution turned out to be so simple I shoudl have seen it immediately. Widen the front axle, dummy! Unbolting and moving the axles out one position moved the steering linkage well away from the alternator. Problem solved. The Delco 12-SI replaced the 10-SI in the mid 80's. The two alternators are dimensionally the same and are basically interchangeable. The 12-SI was upgraded with better cooling to better handle higher amperages. There is usually no need for any more than the most basic 60 Amp alternator on a tractor. However, if you are doing a conversion on a car, the 12-SI is a better choice. The obvious difference in the two alternators is the fan. The improved fan on the 12-SI is enclosed, with exhaust openings around the edge. The 10-SI alternators just had a stamped steel fan. The Denso may now be the second most common alternator for conversions. It is electrically very similar to the Delco, most will be higher power, and the Denso is significantly smaller in size. Many restorers and builders are paying the extra dollars because the smaller size makes this alternator easier to install with other accessories. Some of the following will be a repeat of the condensed version on my 12 volt conversion page. Click HERE if all you want is the short version and wiring diagrams. This page will dig deeper into the proper electrical connections for the Delco® 10-SI and 12-SI alternator most 12 Volt conversions will use. Almost any 12 volt alternator or generator can be used to do a 12 volt conversion. The wiring can be as simple as hooking up a single No.10 AWG wire, to six or more connections on some modern alternators. It is possible to rewind the 8N generator or find a 12 volt generator. Look for a 12 volt generator for the thousand series Ford tractors. The 12 volt generator and external voltage regulator can replace the original 6 volt parts, and use the exact same wiring. The Delco® 10-SI is often referred to as the "TWO WIRE" alternator. This is because many successful conversions only connect two wires from the vehicle wiring system to the alternator. There are really four connections on the back of the (two wire) Delco® 10SI, internally-regulated alternator. There are two large threaded stud connections. The insulated output terminal (BAT+), and the uninsulated ground terminal (GRD-). Then there are two small recessed male spade lug connections usually labeled #1 and #2. Terminal #1 is the "exciter" or "field" wire. Terminal #2 is the "remote voltage sensing wire". There should be no confusion regarding the BAT+ connection. This large insulated threaded terminal post is the one that provides all the current for your accessories and to charge the battery. On most Ford Tractors this terminal will be connected directly to the accessory post on the main terminal block and from that same post to the accessory side of the Ammeter Gauge with #10 or even #8 AWG wires. The other side of the Ammeter Gauge should just have one #10 or #8 AWG wire that goes to the starter solenoid terminal where the large Battery positive cable is connected. The GRD- connector is nearly always left bare. 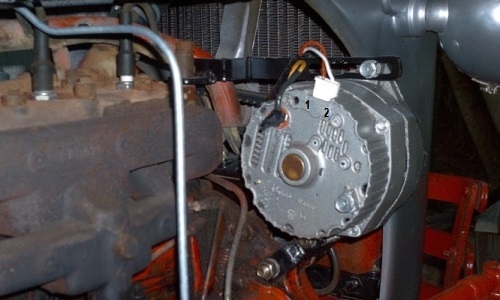 However, you might need a ground wire if you are mounting the alternator to your engine block with something other than plain steel or aluminum brackets. Thoroughly primed and painted parts are often a problem for good ground connections. Powder coating is much more common now. That baked-on plastic coating is a very good insulator. Another reason would be if your engine is electrically isolated from the rest of your wiring, such as in a wooden or fiberglass boat. Brand new primer and paint is the number one reason headlights and starters don't work on some very nicely rebuilt tractors. On most OEM installations this terminal is connected to a switched 12 volt accessory source through a dash-mounted pilot light. This wire provides the "exciter" current to the alternator field windings. Leave this disconnected, and MAYBE your alternator will self excite, maybe not. Revving the engine might get it charging. It's probably not a good idea to regularly run a cold tractor engine at full speed just to get the alternator to start charging. Some conversions connect the field wire directly to a switched accessory source, others recommend connecting to the ignition switch using a resistor or diode. Neither of those options are how the Delco® alternator was designed to work. The standard incandescent dash IDIOT LIGHT is important. I will skip the technical stuff and just say that there are properties inherent in an incandescent light bulb that cannot be properly duplicated by a resistor or diode. Key OFF: No power to the ignition or alternator. If this isn't switched off, it will run the battery down and probably fry the coil. There is no power, so the bulb is off. Key ON with Engine Stopped: Battery 12 volts now flows through the switch, through the dash light, and through the motionless alternator to ground. The light will be on fairly bright. If the light does not glow when the ignition is turned on, the battery may be dead, or the bulb might be blown. Key ON with Engine Running: With a good alternator, and a tight belt, the dash light should go off as soon as the engine starts. The alternator begins making power, so both sides of the dash light are connected to 12 volts. There should not be enough current passing through the bulb for it to light. If there is a failure in the charging system, it will upset this balance and the light will begin to glow. The brightness of the light can be an indication of the magnitude of the failure. The dash light in the alternator voltage sense lead is of fairly low wattage. The alternator will still try to back-feed the ignition when the key is turned off, but the small dash light bulb will not allow enough current for the coil to work properly. Of course your 50+ year old tractor is not equipped with a dash light. But it's easy to add. A small side marker light will work. Stick to the automotive type bulbs though. Many others will not be durable enough to survive the vibration. The dash light bulbs are usually type 168, 194, or 464 with a wedge base. Other similar bulbe will work as long as they are rated around 5 watts at 14 volts. Many trailer marker lights will have these bulbs. Look for lights that have two leads brought out for the bulb. One wire lights that ground the second terminal to the vehicle frame will not work. Do not try using an LED bulb for this application. I found some 14 volt, 5 watt panel lamps in a bin at Radio Shack, These have a red or green lens and mount in a 1/2" hole with the two leads sticking out behind the dash. If you don't want to drill holes in the dash, you could put the light on a bracket near the key switch, or under the hood. My 1948 tractor already had an extra hole in the dash from a previous owner's start switch that bypassed the neutral interlock. I repaired the original start pushbutton and used the extra hole for my alternator light. Once you have a location for the light, simply run a #14 wire from Terminal #1 on the alternator to the light bulb, and from the other side of the bulb to a switched, 12 volt source. This is the Remote Voltage Sensing terminal and it should be connected to the main accessory terminal where your ignition switch, light switch, and other accessories get their unswitched battery power. On the Ford tractors the best place is on the terminal block where the accessory side of the ammeter is connected. The remote sensing terminal is supposed to sense system voltage so the alternator can regulate the proper voltage to your ignition and accessories. This is the "third wire" that is missing from most conversions. If the No.2 terminal is shown at all, it will be jumpered directly to the main BAT output terminal on the alternator. Most Delco 10-SI alternators should revert to internal voltage sensing when the voltage sense terminal is disconnected, so jumpering the voltage sense terminal to the alternator output is usually redundant. WARNING! "MOST" 10-SI alternators should revert to internal voltage sensing, and work with the No.2 terminal not used. However, there are more than a few different designs of the internal regulator used in theae alternators, so there is absolutely no guarantee they will all work the same way. If you have left the voltage sense terminal empty, and the alternator does not charge, before doing anything else, connect a jumper from the No.2 terminal to the BAT terminal, and try it again. Properly connecting the remote sensing wire enables the alternator to regulate voltage to your accessories, and the ignition circuit. If the voltage sensing wire is missing, or jumpered at the alternator, it will lock down the alternator output and prevent it from compensating for other accessory loads. Actual accessory and ignition circuit voltage will be allowed to vary over a much wider range. This variation in system voltage could cause ignition problems, and other under-voltage related issues. The only way to guarantee maximum performance from your new alternator is to run a #14 wire from Terminal #2 and connect it to the main accessory terminal. Finally - If you are going to all the trouble to do a 12 volt conversion, you might want to consider removing the Ammeter. If you run a single wire from the solenoid directly to your junction block, you will remove two connections on the back of the ammeter that carry a lot of current. That gets rid of two potential problem spots. The 6 or 12 volt electrical system does work fine with the original Ammeter. Amps are Amps, the ammeter gauge does not care about voltage, so it will work ok.
A voltmeter will fit in the same hole the ammeter came out of. The only wiring connection you need is a small #14 wire to a switched source. On these tractors the best place is the coil side of the ignition switch. Since a Voltmeter is not IN the main circuit between the alternator and battery, very little current goes through it. In my opinion, a Voltmeter gives a BETTER indication of the condition of your battery and charging system. When you first turn the key on, you get an immediate reading of battery voltage. A reading of 10 volts or less is considered completely dead. Most automotive type starting batteries will not recover from this kind of abuse. Anything over 12 volts is at least a 50% charge. Anything over 12.6 volts is considered fully charged. Again, all of these voltages are when you first turn the key on, before you start the engine. After the engine is running, the voltage should immediately read between 13.5 and 14.5 volts and rapidly drop to around 13 volts, if your charging system is working properly.